This month’s Summer Crush campaign has everyone feeling a little enamored and we can see why! 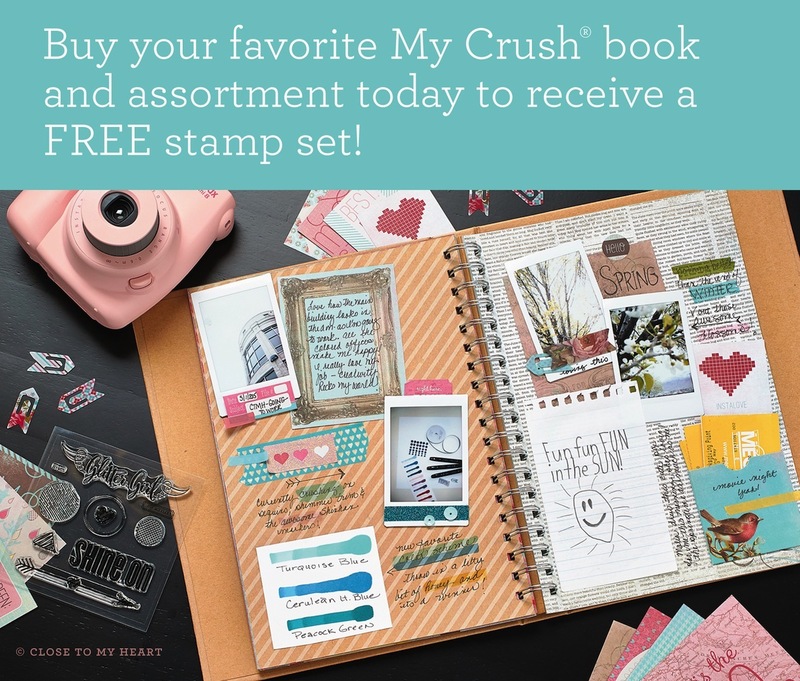 When you purchase any of the My Crush® books offered in the Annual Inspirations 2014–2015 idea book and their accompanying assortments, you will receive the coordinating stamp set FREE! There are so many ways to fall madly in love with these crush-worthy books, but we wanted to share just a peek at another way to love them—a peek inside the books, that is. When you open any one of the wonderful books offered, you will soon see that the papers contained inside the covers are so beautifully designed, they may just jump right out of the covers and onto your scrapbook pages. The page below features an entire page ripped from the My Crush® Modville book that was then sewn directly onto the page base for a trendy edge. Try it out for yourself! Add some stamping from the free My Acrylix® Reel Life stamp set, some journaling squares, additional stitching, and some Aqua Dots and you’ve got the ingredients for success! For a more streamlined look, try trimming blocks of paper from the pages you adore from your My Crush® Bluebird book and attaching them to your page base. Then pull a title and other shapes—like the banners and flower—from the assortment. Add some Oceanside sequins and stamping from the My Acrylix® Love This stamp set, like the pretty little butterfly, and you’re set with some swoon-worthy springtime art! The list of possibilities contained within the covers of each My Crush book is practically endless, so don’t miss out on the opportunity to become infatuated with these spectacular product pairings. This offer is only good through the end of June, and once these My Crush books are gone they are gone for good. So fall in love today by choosing your favorite My Crush pairing, adding your FREE stamp set, and getting your order in as fast as possible! Because who doesn’t need a little extra love in their life?